The new Guide to the Geology of London has chosen ten Itineraries from within the M25 to provide snapshots of the rocks underlying London. It aims to cover all the rocks types that crop out within the area. 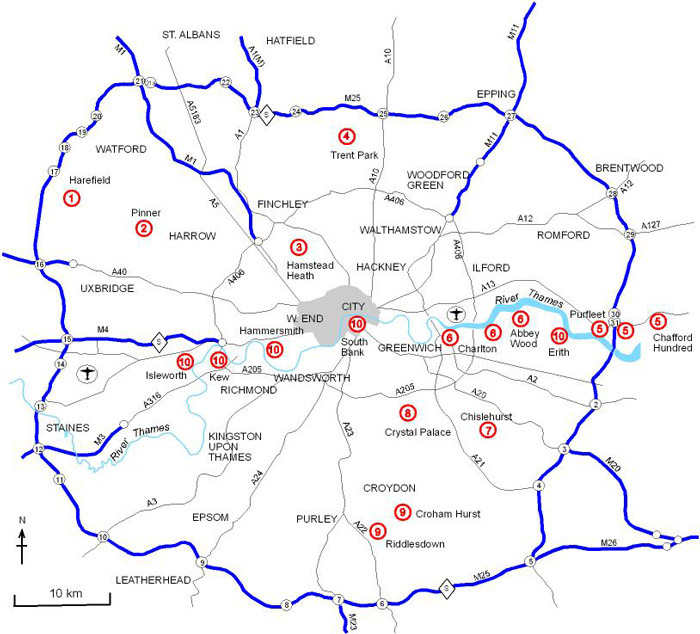 It describes several SSSIs including Harefield, Charlton, Abbey Wood, and Quaternary sites in east London. Chalk is described from the magnificent quarry at Riddlesdown, Croydon as well as underground at Chislehurst and Pinner. Geomorphology walks and the Geological Illustrations of Crystal Palace Park are also described. It is a multi-authored guide drawing on the best authority for the locations chosen. The Geology of London is available in book form (2012 edition) and the itineraries are now sold separately electronically below. Please note that on purchasing an itinerary, you will be emailed a link from where you can download your file. Please note that this link will be available for seven days from the date of purchase and you will only be permitted to download the pdf once. If you are a GA member, you are eligible for a discount so please ensure that you click the ‘Member’ option to receive your discount. This itinerary examines the Cretaceous/Tertiary boundary at Harefield SSSI (limited access) and the overlying Upnor, Reading and Harwich Formations. This contact can be compared with a similar horizon on the other side of the Colne Valley at Northmoor Hill (public access) where a viewing platform also allows access to a ‘fossil swallow hole’. The itinerary includes chalk quarries along the River Colne and a discussion on the Pleistocene gravels. The Pinner Chalk Mines are not currently accessible but because of their importance they have been included in this Guide to the Geology of London. The itinerary examines the historic Cretaceous Chalk Mines including an exposure of the rare example of Hertfordshire Puddingstone in situ in the mine shaft. This itinerary is in the form of a 3-mile circular geotrail intended to give an overview of the geology of London from the vantage point of Hampstead Heath and to look for clues to the rock types underfoot. Past quarrying for sand and clay is investigated, along with the need for water for the growing metropolis. The circular geotrail detailed around Trent Park looks for evidence for the Anglian glaciations that reached as far as London about 450,000 years ago. The walk is about 3 miles long and crosses deep valleys cut into the London Clay and also ridges of pre-Anglian Dollis Hill Gravel capped by glacial till. This itinerary is included in the Guide primarily for its contribution to the Quaternary geology of the lower reaches of the Thames which is described in some detail. The area is changing fast with developments in the old chalk pits, but accessible sections of chalk still remain. Locations included are the SSSIs at Purfleet (limited access) and Chafford Hundred (public open space) and, briefly, the old quarry still visible on the south side of the Lakeside shopping centre complex where details of the Chalk were recorded. A circular geotrail (c. 2 miles) at Chafford Hundred includes a ramp within the housing estate that allows viewing of the unconformity between the Chalk and the Thanet Sand. The SSSI at Gilbert’s Pit, Charlton is the best remaining section of Lambeth Group and Blackheath Beds in the London area and is therefore well worth visiting although access is currently limited. It is the type section for the Woolwich Formation. Valley Grove, Charlton, allows a glimpse through the fence of the Cretaceous/Tertiary boundary. The SSSI at Abbey Wood is famous for the mammal fauna from the Lessness Shell Bed within the Blackheath Beds. Exposures at Plumstead are poor but the itinerary gives an overview of where exposures can still be seen. Chislehurst Caves is one of the few locations in the London area where the Chalk Group can be examined easily without clambering over a mass of vegetation or getting permission to enter behind fences (although there is a charge). The Bullhead Bed of the overlying Thanet Sand Formation is exposed in the roof. Outcrops of Tertiary rocks that can be seen in the vicinity are included in this itinerary even though access is limited. These include the SSSI relating to the Blackheath Member of the Harwich Formation at Elmstead ‘Rock Pit’. An example of a Pulhamite ‘rock face’ can be seen in the grounds of Sundridge Park Manor. Crystal Palace Park in the London Borough of Bromley is a masterpiece of park design by the visionary Sir Joseph Paxton. Created to house the iron and glass ‘Crystal Palace’ (the temporary structure built for the 1851 Great Exhibition in Hyde Park) the park was developed on a series of themed terraces, with the Palace itself at the top of Sydenham Hill. The terraces were linked by a grand central walkway and massive fountains played in gigantic fountain bowls. Today, the Palace is gone, destroyed by fire in 1936; the fountains are quiet and their bowls occupied by the stadia of the National Sports Centre; and the central walk is interrupted by intrusive twentieth century concrete architecture. However, in the southeast corner lies a remnant of Paxton’s original English Landscape Garden, a fragment populated with ‘antediluvian monsters’ and geological cliffs. This remnant is arguably the world’s first attempt at recreating, in a systematic, scientific and ordered way, the geology of the United Kingdom. Its survival and subsequent restoration in 2001 is a remarkable testimony to its constructors and originators. Readily accessible, a visit to Crystal Palace Park will allow the observer to see a distillation of cutting-edge scientific opinion, as considered in the 1850s. The Riddlesdown Chalk Quarry ceased working in the 1960s but has avoided the fate of most quarries of landfill or development and so it is currently the best location to examine Chalk in the London Area. The Quarry is managed by the City of London Corporation who are actively conserving the faces aided by a flock of sheep and goats. Scrub has been cleared from a scree slope and steps installed to give access to the main face. Riddlesdown Quarry is one of the few remaining Chalk exposures in the Lewes Nodular Chalk Formation in this part of the North Downs. It allows observations of fracturing characterstics and illustrates the depths of weathering and karst formation during the Quaternary.Croham Hurst, less than 4 miles away at Breakneck Hill, is public open space. Small exposures of ferruginous cemented pebbles of the Harwich Formation can be seen at the top of the hill and Chalk on the roots of trees at the bottom. Small exposures in the intervening ground reveal Thanet Sand Formation but evidence for the Lambeth Group is elusive. This itinerary highlights the importance of the Thames in relation to the Geology of London. Geological walks can be taken along the foreshore at low tide, particularly on the South Bank in Central London where remnants of a submerged forest can be seen. A better exposure is described from Erith further downstream, while the London Clay can sometimes be seen at very low tide in the Hammersmith-Richmond area. A note on the ‘Lost Rivers’ is included at the end. Burlington House, Piccadilly, London, W1J 0DU. Tel 020 7434 9298. A cookie is a small text file containing information that a website transfers to your computer's hard disk for record-keeping purposes and allows us to analyse our site traffic patterns. Find out more about our cookie and data protection policy.